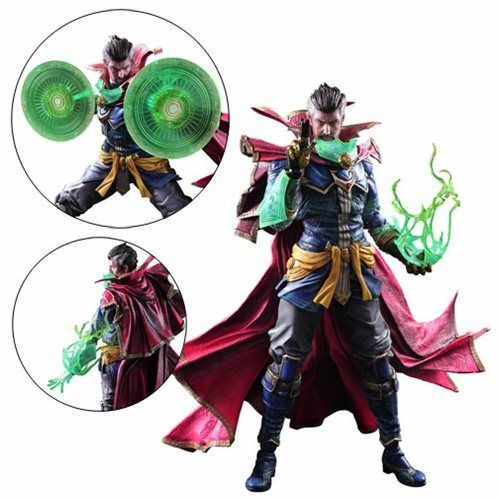 Shopping for Doctor Strange Action Figures? An unlikely kind of superhero. Doctor Strange action figure stands 10 1/2-inches tall. Includes magic glyphs, translucent effect parts, and interchangeable hands! Articulated areas incorporate flexible materials for a wide range of motion. The Marvel Universe Doctor Strange Variant Play Arts Kai Action Figure features Dr. Stephen Strange in his signature cape that can be employed for a multitude of poses. The exaggerated contrast unique to the paintwork of the Marvel Universe Variant series brings out his profound presence, and the figure features articulated areas like the chest, shoulders, and hips that incorporate flexible materials to allow a wide range of motion. Doctor Strange comes with magic glyphs and effect parts constructed with translucent materials, as well as interchangeable hand parts so he can be posed in various dynamic ways. Measuring 10 1/2-inches tall, he includes a display stand and comes packaged in a window box. Ages 15 and up. Dr. Stephen Strange first made a name for himself as a brilliant American brain surgeon. After seven grueling years of training, however, he obtained the power of the mystical arts and became an unlikely kind of superhero. His name? Doctor Strange.